Proposed Tennessee Amendment Declaring God as Source of Liberty Advances in Senate | Have Ye Not Read? The resolution apparently passed the Tennessee House of Representatives last year and has been cleared to move on to the Senate. If it passes the Senate, it goes to the people for a vote, since it’s an amendment to their state Constitution. To all of that, I say “Hooray!” to the bill’s author, Tennessee Representative Micah Van Huss, and to all who are working with him to get it passed. May every state in the Union pass a similar amendment to their Constitutions. “Rights don’t come from the state. The state only protects them. The Constitution implicitly acknowledges that it lacks the authority to either grant or take away your rights, because the power from which they came is higher than government. Unfortunately, we’ve reached the point in time in this country at which government at all levels – local, county, state and national — believe they’re the source of our rights. Truthfully, I never thought I’d see the day in this country in which our elected representatives would have to work to pass a resolution to amend their state Constitution in order to remind Big Government to keep their mitts off our God-given rights. But here we are, today, with brainwashed socialists marching in the streets demanding our Second Amendment right to keep and bear arms be restricted, and social media platforms like YouTube, Facebook and Twitter vying to see (with government approval and backing, of course) which can restrict our rights to free speech the most. Thanks to the U.S. Constitution, the federal government as well as all state and local governments exist solely to secure and protect our God-given rights. 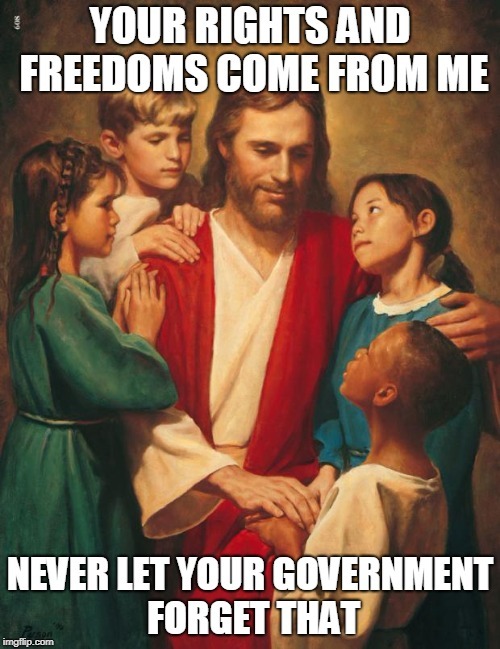 When we start down the road to allowing governments (and their corporate minions) to restrict those God-given rights, we’re on the road to serfdom. Never forget that. The Bible states that, properly run, government is “not a terror to good works, but to the evil” (Romans 13:3). In other words, government is supposed to be a terror to those who would violate your rights. That’s government’s job. And in such a case, we’re to obey and support government, as it’s instituted by God for our own protection – the protection of our God-given rights. St. Paul taught in Romans 13 that government’s purposes are two-fold: To restrain evil by punishing evildoers, and to serve peace and orderly conduct by rewarding good behavior. And that’s quite reasonable, as long as government fulfills that specified role. Our heavenly Father tells the governmental leaders they’ve been judging His children unjustly (i.e., by violating their rights), and embracing and raising up the wicked rather than being a terror to them. The Psalm ends with a call for God to arise and judge the earth. The Psalmist reminds our heavenly Father that He’s to inherit all nations, and therefore their governments are going to need to be cleansed of their wickedness. And that, beloved, is why a freedom-loving elected member of the House of Representatives of the state of Tennessee is finding it necessary to work to reaffirm the God-given rights of the people of Tennessee, and to put that re-affirmation into their own state Constitution. The governments of this country – federal, state, county and local – have in all too many cases abrogated their responsibilities to protect the God-given rights of the citizens against evil, and have instead raised up evil people and protected them. Equal rights under the law is almost a joke in this country, today, with citizens being harassed and in some cases even prosecuted for exercising their God-given rights, while members of the government write regulations protecting themselves from being prosecuted for their own misdeeds. God’s coming judgment will resolve the situation. But in the meantime, we should back patriotic and God-fearing representatives who understand where our rights are truly derived from, and what government’s proper role in securing and protecting those rights are.